I'd been wanting to use the music lines and piano keys from konad m73 for ages and couldn't think what colours to use. 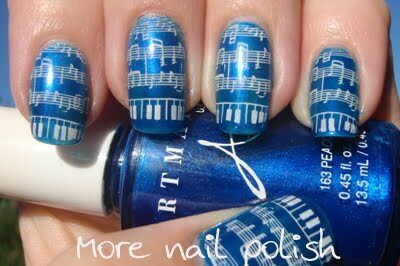 Then my mum found this beautiful blue polish by Artmatic that she had had for ages. I don't even know if its still available. But I've got some other readily available polishes that are similar, and I'll do a comparison swatch soon. I stamped this using konad special polish in white, the topped it with two coats of Seche Vite. I was so happy with this design that I actually left it on my nails for a few days, which is really saying something from me as I like changing my polish almost daily. Here is my m73 plate. So far I've used two of the images from this plate. That is a really awesome mani! 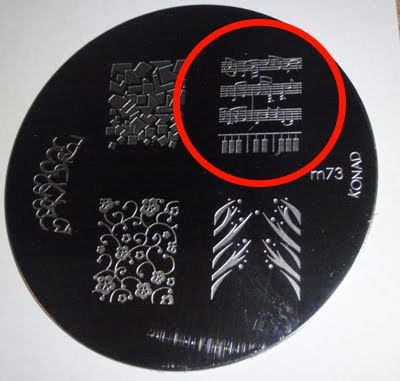 My favorite Konad Stamp and the first disk I bought. Love this!